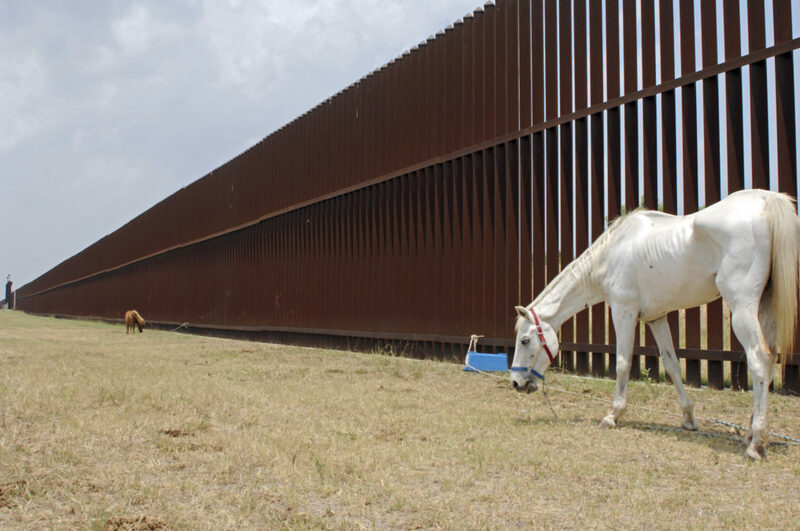 A horse grazes along the U.S.-Mexico border fence in Brownsville, Texas. Government lawyers still are settling claims with Texas landowners over the fence. The rightful owner of a forgotten sliver of the U.S.-Mexico border near the Rio Grande is a puzzle the federal government still hasn’t solved. Twenty feet wide and 250 feet long, the scrubby slice of land falls within Starr County, one of the poorest in Texas. The tract in the tiny town of Rio Grande City, tucked behind a Walmart, is vacant. A short walk away, a two-lane bridge crosses the Rio Grande to the Mexican state of Tamaulipas. The case – United States of America v .10 Acres of Land, More or Less, et al – targeted a piece of property with an unknown owner. As in many of the roughly 330 lawsuits the Justice Department filed in 2008 to seize land in Texas, the U.S. Border Patrol considers this one prime real estate for its border fence. Spanish grants dating back to the 1700s originally portioned the land to families that later sold their property or passed it down through the generations, but they rarely reported those transfers to the county clerk. The federal government has spent a decade chasing a meandering paper trail that has sent researchers combing through yellowed government files, testing the faded memories of neighbors and even perusing the local public library as they try to sort out who owns the land. This case is one of about 90 pending lawsuits brought nationwide by the Justice Department to seize private land for building fencing along U.S. border with Mexico. Federal officials say they haven’t stopped trying to resolve the lawsuits, now consolidated into about 63 open cases, all for land in Texas. Reveal from The Center for Investigative Reporting analyzed 443 condemnation lawsuits filed by the Justice Department, including cases related to earlier fence projects from the late 1990s in California. Many of those cases were consolidated. 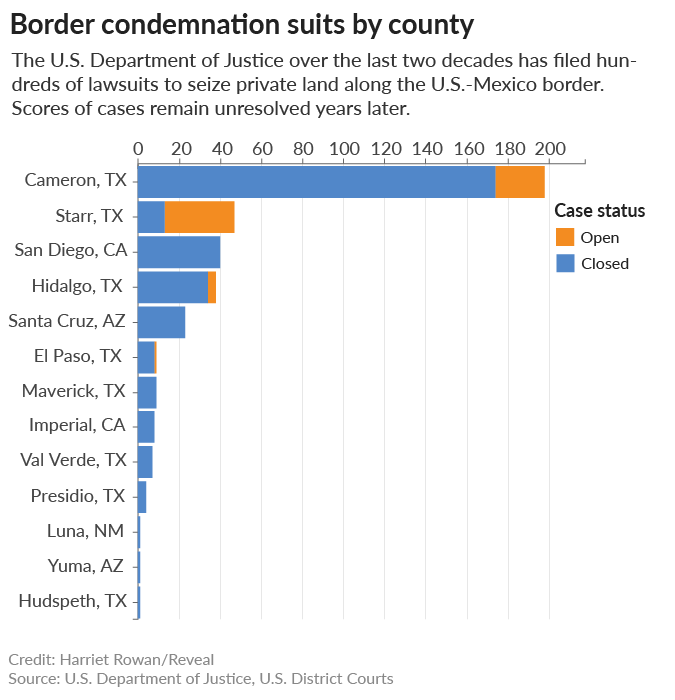 Most of the pending cases involve property in Starr County, where the fence project has been bogged down by environmental concerns, cross-border water disputes with Mexico, intransigent owners and questionable planning. Construction there remains on hold – for now. In recent months, the Justice Department sent letters to landowners in the Rio Grande Valley, notifying them of plans to take their land. Some property owners attribute the letters to President Donald Trump’s insistence that a border wall be built. But the Justice Department says it’s simply finishing what it started two presidencies ago. While the Justice Department works toward closing the cases, the president’s plan for a border wall has faced other barriers. The Trump administration’s 2018 budget, released last month, asks Congress for $1.6 billion to build new walls or replace existing barriers. Congress already balked at paying to construct new barriers. For Noel Benavides, whose wife’s family settled a swath of riverfront property 250 years ago in what today is the Starr County town of Roma, it’s all a waste of money – and a familiar story. He said the government wrongly identified different tracts of his land it wanted to take and offered him a price that was far too low. But the government doesn’t have to resolve the lawsuits by agreeing on a fair price or identifying all the landowners to begin construction. Once the Justice Department sues and tells the court it’s taking the land, the property belongs to the federal government. There’s no single reason why the lingering lawsuits remain open, said Smith, the federal prosecutor. Sometimes the title research listed unconfirmed owners. Or owners died without leaving a will and probate of the estate never took place, making true ownership anyone’s guess. In another instance, the government learned that the identified owner – the International Boundary and Water Commission, which oversees the border treaty and water agreements between the U.S. and Mexico – didn’t actually own the land. The government had to amend its lawsuit to include the adjacent property owners. The Justice Department, along with other agencies, sought help in sorting out ownership, heirs and property interests, even publishing notices in local papers. In some cases, it sued. Questions of ownership “had been languishing for 100 years in some instances,” said Rowdy Adams, a retired Border Patrol agent who oversaw the project under the Secure Fence Act of 2006. Justice Department attorneys can’t close a case until they know who all the landowners are, Smith said. That’s the situation with the speck of land in Rio Grande City. Neither the Border Patrol nor the Army Corps of Engineers could find an owner, even after scouring public records, chasing down mail carriers and chatting up neighbors and nearby property owners, according to court records. The Starr County appraisal district, where precise record keeping was a fuzzy notion until Chief Appraiser Rosalva Guerra arrived three and a half years ago, can’t tell who the owner is. One company finally agreed to finish researching owners – in July 2013, five years after the government sued to take the land. But it still hasn’t found them all. Starr County was the last stretch of borderland to finish title research, wrapping up about two years ago, Smith said. The money spent on real estate and related activity for prior fence projects – not including construction costs – could reach upward of $120 million, according to a review of lawsuits, government figures and reports by Reveal. $4 million in Justice Department litigation fees. $21 million in potential real estate expenses for Customs and Border Protection to close cases. $78 million already paid in real estate-related costs, including land surveys, appraisals, title work, compensation and support from the Army Corps of Engineers. $17.8 million the agency paid to the Department of the Interior for environmental mitigation fees, according to a 2016 report by the U.S. Fish and Wildlife Service. In about 70 real estate deals, the federal government avoided lawsuits by directly buying land from property owners willing to sell, said Jim Frisinger, an Army Corps of Engineers spokesman. The government paid about $1.5 million to buy roughly 125 acres in those deals. Customs and Border Protection has yet to provide an itemized accounting of those expenses. Reveal’s Freedom of Information Act request for the information has not been filled. The Army Corps of Engineers referred most questions to Customs and Border Protection. A review of Justice Department data and court records shows that the federal government has paid landowners nearly $43 million after seizing their land through eminent domain over the last two decades. On average, the government has paid landowners about $14,175 per acre in Starr County. While that’s considerably more than the average per-acre price in Imperial County, California, of $1,737, it’s only a fraction of the compensation in Cameron County, Texas, which averaged $62,158 per acre. Landowners who went to court after refusing to sell their land directly to the government generally were paid handsomely – up to nearly $5 million for a local attorney and others whose plans to develop property were scuttled by the fence. For all that work, the government doesn’t always keep the land the Justice Department sued to take. In nearly a dozen cases, the government returned land to the property owner through revestment, for instance, when the owner agreed to grant access to another piece of land. But that still doesn’t give property owners much hope, despite pledges from advocates and civil rights attorneys to dig in against future efforts to take land in the lower Rio Grande Valley for a border wall. A feeling of resignation has taken over some landowners, regardless of what Congress does about funding, said Efrén Olivares, director of the Texas Civil Rights Project’s racial and economic justice program. The legal advocacy group aims to help landowners who want to defend their property against seizure or get the most money they can from the government while delaying the wall for as long as they can. Olivares says Starr County appears to be the next target for the government’s plan to acquire land. “I don’t think they’re going to be following funding news out of (Washington,) D.C.,” he said of property owners in Texas. “The feeling is almost hopelessness from some of them, just seeing they took it from other people. Reveal researcher Harriet Rowan contributed to this story. It was edited by Jennifer LaFleur and copy edited by Nikki Frick. Andrew Becker can be reached at abecker@revealnews.org, and David Rodriguez can be reached at drodriguez@revealnews.org. Follow them on Twitter: @ABeckerReveal and @DaveeJonesLock. $4 million in Justice Department litigation fees. $21 million in potential real estate expenses for Customs and Border Protection to close cases. $78 million already paid in real estate-related costs, including land surveys, appraisals, title work, compensation and support from the Army Corps of Engineers. $17.8 million the agency paid to the Department of the Interior for environmental mitigation fees, according to a 2016 report by the U.S. Fish and Wildlife Service.